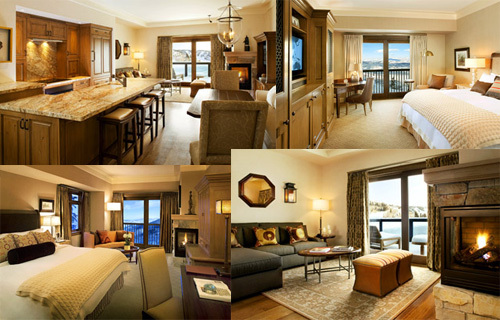 The St. Regis at Deer Crest overlooks the lower Deer Valley area of Park City and the main entrance to the Deer Valley Ski Resort. The funicular that serves as the gateway for guests to enter the hotel and its service-rich Starwood Hotel amenities is unmistakably eye-catching. From inside the St. Regis Resort and Residences, views of Deer Valley ski runs and the Jordanelle Reservoir can be enjoyed from almost any level. The first seven floors of the St. Regis make up the condominium portion of the hotel and have 67 two-, three-, and four-bedroom models, the majority being the three-bedroom models. Each unit ranges in size from 1800 to 3600 square feet and have lockout capabilities allowing for flexible usage for owners wishing to utilize the St. Regis managed rental program. All of the condominiums come fully furnished to St. Regis Brand standards. The upper 4 floors make up the residence levels of the St. Regis in Deer Valley. The 26 two-, three-, and four-bedroom units offer a much more spacious central gathering area than the condominiums, and, due to their altitude in the resort, grander views. Residences range in size from 2000 to 6500 square feet and do not include furnishings. The residences each have two parking spaces and are accessed via private elevators. While the luxury condominiums and residences at the St. Regis are impressive and well appointed in a mountain elegance style, it is the level of service and public spaces that will set it apart from other Park City and Deer Valley resort real estate offerings.